We chose a modern hospital look to differentiate Jim's practices from other Acupuncture outfits. 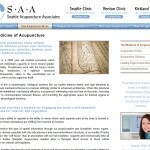 Since Acupuncture is relatively new in America we sought to draw traffic with typical Western medicine jargon. 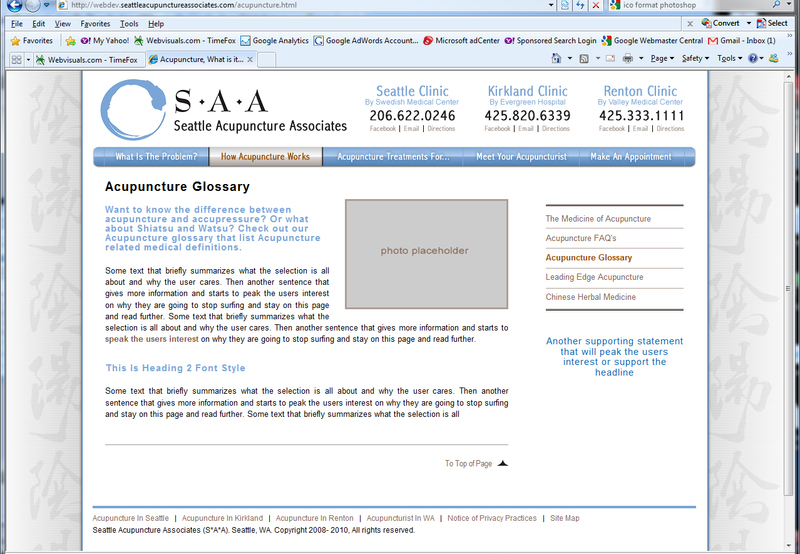 Interviewing the client we found a need to educate potential patients on the spectrum of treatments Acupuncture works for. 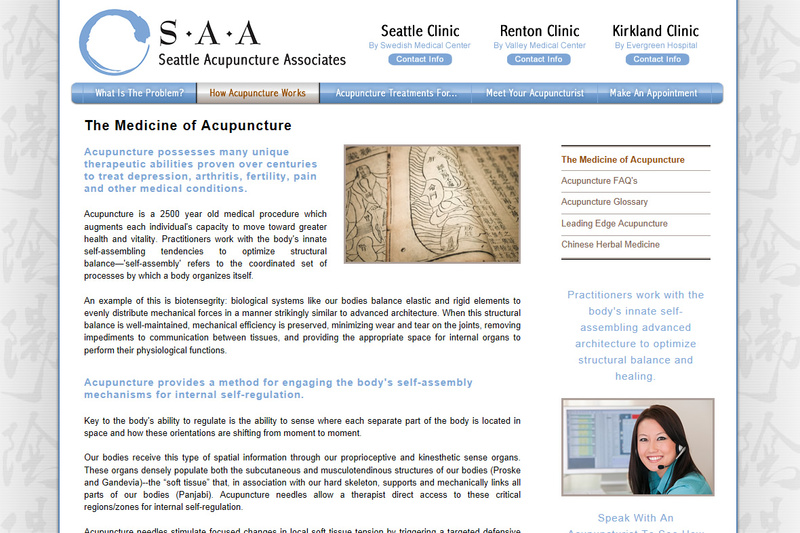 Webvisuals built the Seattle Acupuncture Associates website, gave it a Seattle web design finesse that overlay-ed a stalwart information architecture comprised of the best keyword combinations for Acupuncture practices. 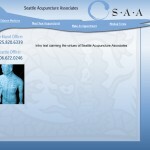 Each month the site is generating a lot of phone calls to speak with an Acupuncturist at their four clinics. 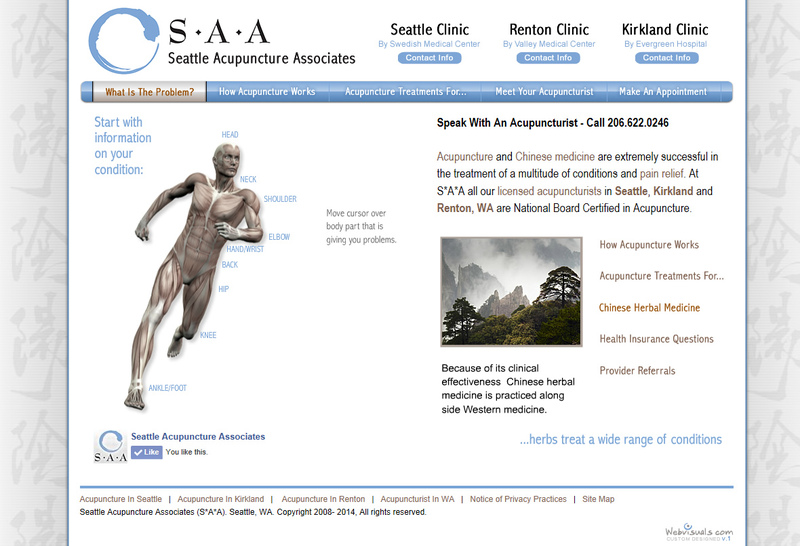 Owner Jim of Seattle Acupuncture Associates wanted a Seattle web design look-n-feel that went away from traditional Acupuncture web designs to something modern and upbeat. We kept a more traditional ancient Chinese background look, then overlay-ed on top of this a clean 1 prominent color user interface with tons of healing white space. 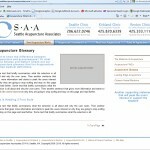 The goal of the SeattleAcupunctureAssociates.com website was to expound the benefits of Acupuncture in a Western medicine setting. This was accomplished by first asking what the problem was by utilizing an interactive acupuncture model that displayed over 80 typical disorders by body part. When the user identified the problem they we’re then introduced to the Acupuncture treatments for those problems that offered a non-evasive way to feeling better. We also mated all those typical disorders with the keyword Acupuncture and organic traffic exceeded all expectations when the site launched and began to get indexed in the major search engines. 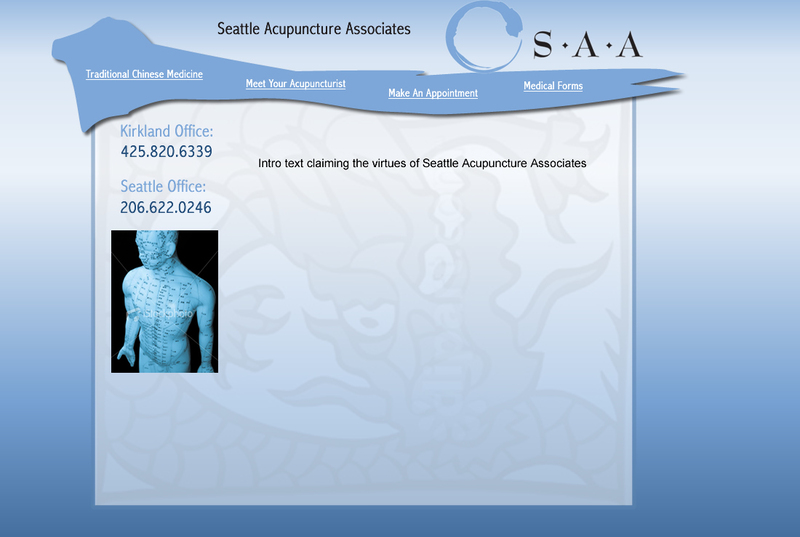 Today the Seattle Acupuncture Associates website continues to grow in organic traffic and the overarching goal of making the phone ring has been achieved. 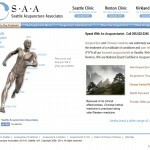 The look-n-feel of the Seattle Web design has withstood the test of time. I am very happy with how version 1 of our site worked out. Not only is it a nice design but it has done really well organically in the search engines. That means business coming in daily.